The kissing scene between Arshad Warsi and Vidya Balan may have generated much-hype for this Friday's release, Ishqiya, but the Munnabhai actor has vowed never to lock lips on screen again. Arshad, who plays a criminal in the movie, says he was extremely apprehensive and first-time director Abhishek Chaubey had to pep talk him before the shoot. "Mark my words, this is the first and the last time I have done an on-screen kiss. Bass ho gaya, aur nahi (enough of it, no more)," Arshad said. Though the actor doesn't regret the act since it was as per the 'demand of the script', he admits it was a 'scary' experience. "I respect the vision that Vishal Bhardwaj and Abhishek carried. They explained the film, its texture, the setting and the characterisation due to which I was convinced about the kissing scene. But only I know how scared I was," Arshad said. When asked what really convinced him to do the scene, especially since he was so apprehensive to begin with, Arshad said it was important to bring out his character's point of view. "In Ishqiya, Naseer and I have our point of views when it comes to the lady in our lives, Vidya Balan. The entire romantic encounter is quite balanced because there is a man, who has seen life (Naseer) and hence is in love with her. On the other hand, I -- being younger -- am in lust with her," the 41-year-old actor said. 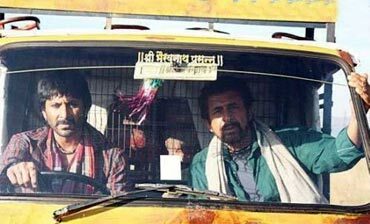 Recounting one of the hilarious sequences in the film which establishes his frivolous character of Babban, Arshad smiles, "The moment I enter this village, the first thing I do is ask a kid about directions to a red light area. It is pretty reflective of this character, who doesn't believe in love but only lust." Arshad adds that Ishqiya has a lot more than just Naseeruddin Shah, Vidya Balan and himself. A co-production of Shemaroo Entertainment and Vishal Bhardwaj Pictures Pvt Ltd, Ishqiya also stars supporting actors like Salman Shahid (of Kabul Express fame) and Rajesh Sharma. "There are so many other talented actors in the film, who have been handpicked by Vishal and Abhishek. It was never just about its principal protagonists. It is this kind of combination that leads to a masterpiece," Arshad said. After Ishqiya, Arshad will reprise his role in Munnabhai Chale America, the third movie in the hit Munnabhai series.